In December 2010, Safe Bulkers (SB) contracted with a Chinese yard for the construction of a Cape-size vessel (180,000 MT DWT Capacity). The vessel was originally expected to be delivered to SB during the third quarter of 2012, but in any case not later than December 31st, 2012. During the most recent earnings conference call, the company's CEO Mr. Polys Hajioannou disclosed that the yard was facing significant construction delays and would not be in position to meet the delivery deadline. Mr. Polys Hajioannou also briefly discussed the options available to the company stemming from the yard's inability to meet its contractual obligations. I believe that SB has a huge bargaining chip on its side that could greatly improve its current financial position. The contracted price for the new-building vessel was $53 million. 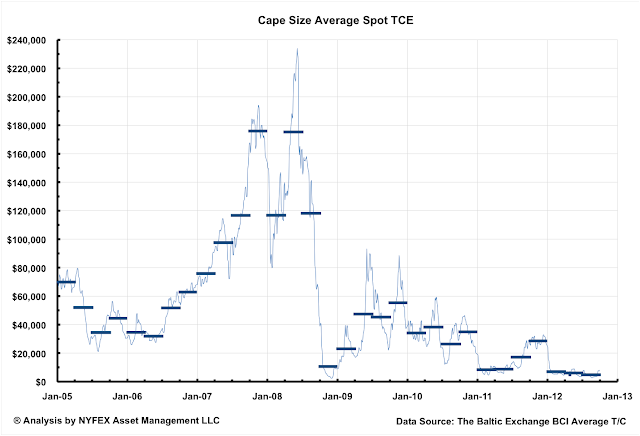 In today's market environment, the resale price of a Cape-size new-building vessel is approximately $41 million. Safe Bulkers: Would Low Valuation Lead To A Management Buyout? In two of my previous articles, I had the opportunity to look at Safe Bulkers Inc. (SB) as a potential investment in a diversified shipping portfolio. I also examined the company's risk exposure stemming from its long-term period deals with troubled shipping company Daiichi. Since writing my articles last September, Safe Bulkers' shares have lost almost half their value in a span of less than three months. For the quarter ended September 30th, 2012, we estimate that Diana Shipping Inc. (NYSE: DSX) generated basic earnings per common share of $0.16 on net income of $12,850,000. We estimate that TCE Revenues were $53,150,000 and the average TCE rate was $20,650. As of September 30th, 2012, we estimate that book capitalization was $1.716 billion including shareholders’ equity of $1.257 billion, and debt outstanding of $459 million. Its debt to capitalization ratio stood at 26.8%. We also estimate that DSX had approximately $448 million cash on hand as of the end of the quarter. Following the acquisition of M/V Amphitrite during the quarter, the company owned a fleet of 29 dry cargo vessels (consisting of 17 panamax size vessels, two post-panamax vessels, and 10 cape size vessels), with a total DWT carrying capacity of 3,278,000 MT, and an average age per vessel of 6.8 years as of September 30th, 2012. During the quarter DSX acquired one post-panamax new building vessel, scheduled for delivery ex-yard in November 2012, for a purchase price of $24.6 million. The company also has on order two panamax vessels, scheduled for delivery in the fourth quarter of 2013, at a contract price of $29 million per vessel. In addition, Diana Shipping has a 10.4% interest in Diana Containerships (NASDAQ: DCIX), a publicly traded company specializing in container ships. For the quarter ended September 30th, 2012, we estimate that Diana Containerships Inc. (NASDAQ: DCIX) generated net income of $2,000,000 or $0.07 basic earnings per common share. We also estimate that TCE revenues were $14,500,000 and the net average TCE rate was $17,500. As of September 30th, 2012, we estimate that the company had a total book capitalization of $341,9 million, including debt outstanding of $92.7 million. The debt to capitalization ratio stood at 27.1%. Following the secondary offering of 9,115,803 shares during the quarter (at a gross price per share of $6.25), we estimate that DCIX had approximately $65 million cash on hand (excluding restricted cash of $9.2 million) as of September 30th, 2012. Based on the company’s revised dividend policy, DCIX intends to declare a variable quarterly dividend equal to its operating cash flow minus any cash expenses and reserves for vessel dry-dock maintenance and special surveys. According to our estimates for the quarter, the company generated cash from operations of $8,600,000. On this basis, we forecast that DCIX will declare a quarterly dividend of $0.30 per share as per the company’s official guidance. Diana Containerships owns a fleet of nine panamax containerships, with an aggregate capacity of 37,422 TEU, and an average age of 14.2 years as of September 30th, 2012. The company recently announced the acquisition of a 1995-built panamax containership, for a purchase price of $30 million. The vessel will be delivered to the company on November 19th, 2012. Based on yesterday’s closing price of $5.33 per share, the company has a market capitalization of $171.6 million. For the quarter ended September 30th, 2012, we estimate that Eagle Bulk Shipping Inc. (NASDAQ: EGLE) generated a net loss of ($31,000,000) or basic earnings per common share of ($1.85). Basic earnings per share reflect the company’s 4:1 reverse stock split during the second quarter. We estimate that the company’s fleet of 45 owned-vessels generated net TCE Revenues of $41,000,000 for an average TCE of $9,900. We also estimate that EBITDA was $9,700,000, and Adjusted EBITDA (for credit agreement purposes – excludes stock compensation expense) was $12,150,000. According to our estimates, EGLE burned through $1,800,000 in cash for its operating activities during the third quarter, and had approximately $12,500,000 cash on hand (including restricted cash), as of September 30th, 2012. Eagle Bulk Shipping owns a fleet of 45 SUPRAMAX dry cargo vessels with a total DWT capacity of approximately 2,450,000 MT, and an average age per vessel of 5.5 years as of September 30th, 2012. In my previous articles, I had the opportunity to look into detail at two shipping companies I would consider adding in a diversified shipping portfolio: Safe Bulkers Inc. (SB), and Baltic Trading Limited (BALT). The two companies are executing different chartering strategies, in effect offering different risk / reward profiles. Safe Bulkers operates the majority of its vessels on fixed-rate time charters, providing the company with earnings visibility. Baltic Trading on the other hand operates its vessels on index-related time charters, providing full exposure to the vagaries of the spot freight market. Fixed-rate charters may appear the safer and more conservative way to go, but one unintended consequence is increased credit exposure. The risk of default gets bigger with longer durations, higher rates, but also lack of a diversified customer base. Safe Bulkers has relied on two Japanese charterers for the majority of its revenues for the past four years as demonstrated on the table below. Its credit exposure to Daiichi Chuo Kisen Kaisha (Daiichi) is exceptionally high, and should be a cause of concern to investors, especially given Daiichi's gloomy outlook for its current fiscal year. Investors in shipping stocks are well familiar with the current state of affairs. Plagued by a vicious over-supply of modern vessels, the industry is struggling to keep its head above water, just long enough to see the next recovery. Companies that are best suited to sustain such prolonged period of depressed freight rates ideally must be well capitalized to meet their capital expenditure requirements, must provide earnings visibility, and must sport low running costs. In this article I look at two leading shipping companies, namely Diana Shipping Inc. (DSX) and Safe Bulkers Inc. (SB) and how they fare in these three categories. Both companies are run by first-class ship owners who have lived through (and survived) several shipping cycles. They both specialize in the dry-cargo segment of the bulk shipping industry. Value Investors seek opportunities in companies where the intrinsic value is less than their market capitalization. The bulk shipping industry should be no exception to this fundamental rule. In this article, I compare the intrinsic value per share for three shipping companies, namely Baltic Trading Limited (BALT), Eagle Bulk Shipping (EGLE), and Genco Shipping & Trading Limited (GNK), relative to their stock price. All three companies specialize in the dry cargo segment of the industry. Baltic Trading Limited owns a fleet of 9 vessels (with a total DWT capacity of 672,000 MT and average age per vessel of 2.7 years), and has a market capitalization of $69 million. Eagle Bulk Shipping Inc. owns a fleet of 45 vessels (with a total DWT capacity 2,451,000 MT and average age per vessel of 5.3 years), and has a market capitalization of $52 million. Genco Shipping & Trading Limited owns a fleet of 53 vessels (with a total DWT capacity of 3,812,000 MT and average age per vessel of 7.1 years), and has a market capitalization of $145 million. Genco is the parent company of Baltic Trading. It has a 25% interest in BALT, but due to a dual share structure, it exercises full ownership and managerial control. In late June 2012 shareholders of Eagle Bulk Shipping Inc. (NASDAQ:EGLE) breathed a sigh of relief for their beleaguered shipping company. Saddled with a massive debt burden in excess of $1.1 billion, the company faced the prospect of violating its debt covenants - or simply running out of cash - by the end of the year. But when Eagle announced an outline of its amended credit agreement on June 20th, 2012, it appeared as if it had escaped from financial ruin relatively unscathed. In exchange for a higher interest margin and stock warrants, its lenders had agreed to extend the term of the loan to the end of 2015, with no scheduled loan repayments prior to its maturity. They had also agreed to a new set of covenants to be gradually phased-in, presumably when the company would be in a position to meet them. I like to think differently. A close look into the company's amended credit agreement - full terms of which only became available with the company's filing of its quarterly report on August 9th - points to a renewed threat for a technical default and/or a cash crunch, as early as next year. For the quarter ended June 30th, 2012, we estimate that Eagle Bulk Shipping Inc. (NASDAQ: EGLE) generated a net loss of ($14,700,000) or basic earnings per common share of ($0.94). Basic earnings per share reflect the company’s 4:1 reverse stock split during the quarter. We estimate that the company’s fleet of 45 owned-vessels generated net TCE Revenues of $48,300,000 for an average TCE of $11,850. We also estimate that EBITDA was $16,200,000, and Adjusted EBITDA (for credit agreement purposes – excludes stock compensation expense) was $19,300,000. According to our estimates, EGLE had approximately $34,000,000 cash on hand (including restricted cash), as of the end of the quarter. Eagle Bulk Shipping owns a fleet of 45 SUPRAMAX dry cargo vessels with a total DWT capacity of approximately 2,450,000 MT, and an average age per vessel of 5.3 years as of June 30th, 2012. For the quarter ended June 30th 2012, we estimate that Safe Bulkers Inc. (NYSE: SB) generated net income of $20,900,000 or $0.27 earnings per share. We also estimate that adjusted net income was $23,900,000 or $0.31 per share. (Adjusted net income excludes any gain/(loss) on derivatives; we estimate that net loss on derivatives was $3,000,000). We estimate that the company’s net TCE Revenues were $45,000,000 & the fleet average TCE was $24,300. We also estimate that SB generated EBITDA of $30,600,000, and adjusted EBITDA of $33,600,000. Based on the company’s operating performance, we forecast that the company will declare a quarterly dividend of $0.15 per share, unchanged from the previous quarter. With the delivery of M/V PEDHOULAS LEADER during the quarter, Safe Bulkers is operating a fleet of 21 bulk carriers (consisting of 5 PANAMAX, 4 KAMSARMAX, 10 POST-PANAMAX, & two CAPE size vessels), with a total DWT capacity of 1,968,000 MT, and an average age of 4.1 years as of June 30th 2012. In addition, the company has a remaining new-building program for 8 vessels with a total DWT capacity of 741,200 MT. Three of these vessels are scheduled for delivery during the remainder of 2012. 20% Dividend Yield – Gold Mine or Fool’s Gold? The Case for Investing in Diana Containerships Inc.
Diana Containerships Inc. (NASDAQ: DCIX) declared a quarterly dividend of $0.30 per share in today’s earnings report, in line with its amended dividend policy and previous guidance. Just last month DCIX had issued 8,100,000 new shares in a public offering at $6.25 per share. The stock closed yesterday at $6.13 per share. The dividend yield at the public offering price is a whooping 19.2% on an annualized basis. Is this too much of a good thing? Is the dividend rate sustainable? What risks, hidden or not, are associated with such an investment? DCIX owns a fleet of nine panamax containerships, ranging in capacity from 3,426 TEU to 4,729 TEU, and with an average age of 14.0 years as of June 30th, 2012. Two of the company’s vessels were acquired as new-building units. The remaining seven vessels were acquired in three separate sale/lease-back transactions over the past 14 months. As is typical in many sale/lease-back transactions, the buyer (in this case Diana Containerships) acquired the vessels at an above FMV price, in exchange for an above FMV charter rate. DCIX paid $196.5 million for the seven vessels that came attached with an average gross charter rate of $22,820 per day, and an average remaining duration of 1.5 years as of June 30th, 2012. The good news about this type of sale/lease-back transaction is that DCIX can immediately pass the cash flow from the charters to the shareholders. Indeed, the company in its amended dividend policy, vowed to distribute 100% (up from 70%) of its operating cash flow to shareholders, minus any cash expenditures or reserves for vessel dry-dock maintenance and special surveys. The bad news is that DCIX has assumed a major residual risk in terms of charter replacement and asset values. To demonstrate how volatile the time charter market can be, consider the just announced employment for M/V CENTAURUS, one of the company’s two new-building units. The vessel is coming off a two-year charter at $20,000 per day and was fixed for 8 to 12 months at $7,500 per day! But the real question is how much the company’s assets will be worth once the sale/lease-back charters are done. DCIX today has an enterprise value of approximately $220 million. The only tangible assets are its nine vessels. At the end of 2013, the company’s fleet will be on average 15.5 years old. Will it be worth more or less than $220 million? This is the million-dollar question. Investors may buy the stock as a dividend play, but in reality the stock is more of an asset play in a sector/industry that have traditionally been among the most volatile. It seems after all that 20% dividend yields are never served as free lunches. For the quarter ended June 30th, 2012, we estimate that Genco Shipping & Trading Limited (NYSE: GNK) generated basic earnings per common share of ($0.62) on net loss attributable to GNK shareholders of $26,600,000. We estimate that the company generated net consolidated TCE Revenues of $60,800,000 and the average TCE rate was $11,000 (including the vessels owned by the company’s subsidiary Baltic Trading Limited). We also estimate that EBITDA were $28,200,000. At the parent level and as of June 30th, 2012, we estimate that book capitalization was $2,670 million, including shareholders’ equity of $1,150 million, and total debt of $1,520 million. The debt to capitalization ratio stood at 56.9%. We also estimate that GNK had approximately $205 million cash on hand (including restricted cash) at the parent level as of the end of the quarter. As of June 30th, 2012, Genco Shipping & Trading owned a fleet of 53 dry cargo vessels with a total DWT capacity of approximately 3,812,000 MT, and an average age per vessel of 7.1 years. In addition to the company’s own fleet, its subsidiary Baltic Trading Limited (NYSE: BALT) owns a fleet of nine dry cargo vessels with a total DWT capacity of approximately 672,000 MT, and an average age per vessel of 2.7 years as of June 30th, 2012. GNK has a 25% ownership interest in Baltic Trading Limited. Based on today’s closing price of $2.16 per share, GNK has a market capitalization of $95 million. For the quarter ended June 30th, 2012, we estimate that Diana Shipping Inc. (NYSE: DSX) generated basic earnings per common share of $0.20 on net income of $16,600,000. We estimate that TCE Revenues were $54,400,000 and the average TCE rate was $22,300. As of June 30th, 2012, we estimate that book capitalization was $1.710 billion including shareholders’ equity of $1.249 billion, and debt outstanding of $463 million. Its debt to capitalization ratio stood at 27.0%. We also estimate that DSX had $457 million cash on hand as of the end of the quarter. Following the delivery of M/V Philadelphia and the acquisition of M/V Melia during the quarter, the company owned a fleet of 28 dry cargo vessels (consisting of 17 panamax size vessels, one post-panamax vessel, and 10 cape size vessels), with a total DWT carrying capacity of 3,180,000 MT, and an average age per vessel of 6.7 years as of June 30th, 2012. During the quarter DSX acquired one post-panamax new building vessel, scheduled for delivery ex-yard in August 2012, for a contract price of $25 million. During the previous quarter, DSX had placed an order for two panamax vessels, scheduled for delivery in the fourth quarter of 2013, for a contract price of $29 million per vessel. In addition, Diana Shipping has a 10.7% interest in Diana Containerships (NASDAQ: DCIX), a publicly traded company specializing in container ships. Based on yesterday’s stock closing price of $6.75 per share, we estimate that DSX has a market capitalization of $555 million and an enterprise value of $561 million. For the quarter ended June 30th, 2012, we estimate that Diana Containerships Inc. (NASDAQ: DCIX) generated net income of $2,100,000 or $0.09 basic earnings per common share. We also estimate that TCE Revenues were $14,900,000 and the net average TCE rate was $18,200. As of June 30th, 2012, we estimate that the company had a total book capitalization of $294.4 million, including debt outstanding of $92.7 million. The debt to capitalization ratio stood at 31.5%. We also estimate that DCIX had $21 million cash on hand (including restricted cash of $9.2 million) as of the end of the quarter. Based on the company’s revised dividend policy, DCIX intends to declare a variable quarterly dividend equal to its operating cash flow minus any cash expenses and reserves for vessel dry-dock maintenance and special surveys. According to our estimates for the quarter, the company generated cash from operations of $8,700,000. On this basis, we forecast that DCIX will declare a quarterly dividend of $0.30 per share as per the company’s official guidance. Diana Containerships owns & operates a fleet of nine panamax containerships, with an aggregate capacity of 37,422 TEU, and an average age of 14.0 years as of June 30th, 2012. In July 2012, DCIX issued 8,100,000 shares in a public offering at $6.25 per share, raising gross proceeds of $50,625,000. Following the offering, Diana Shipping Inc. (NYSE: DSX) will have a 10.7% ownership stake in the company. Based on yesterday’s close price of $6.08 per share, we estimate that DCIX has a market capitalization of $190 million and an enterprise value of $213 million. For the quarter ended June 30th, 2012, we estimate that Navios Maritime Partners L.P. (NYSE: NMM) generated net income of $17,000,000. We estimate that earnings attributable to common unit holders were $16,700,000 or $0.29 per common unit. We also estimate that Time Charter & Voyage Revenues for the quarter were $49,000,000 and the net average TCE rate was $29,500. Navios Maritime Partners operates a fleet of 19 vessels with an aggregate DWT capacity of 2,125,000 MT and an average age of 7.4 years as of June 30th, 2012. NMM owns seventeen of the 19 vessels in the fleet and operates the remaining two on long-term operating leases with purchase options. On July 23rd, 2012, NMM declared a quarterly cash distribution of $0.4425 per common unit, compared to $0.44 per unit for the previous quarter. For the quarter ended March 31st, 2012, we estimate that Eagle Bulk Shipping Inc. (NASDAQ: EGLE) generated basic loss per common share of ($0.29) on net loss of ($18,500,000). We estimate that the company’s fleet of 45 owned-vessels generated net TCE Revenues of $42,100,000 for an average TCE of $10,400. We also estimate that EBITDA for the quarter was $11,000,000, and Adjusted EBITDA (for credit agreement purposes) was $13,100,000. Our estimate is based on the following key assumptions: (I) It excludes the results of the company’s freight trading operations, (II) the company’s vessels that traded in the spot market earned an average gross TCE of $9,200 during the quarter, and (III) Two of the company’s vessels were dry-docked during the quarter, resulting in 30 days off-hire. As of March 31st, 2012, we estimate that book capitalization was $1.79 billion, including shareholders’ equity of $0.66 billion and total debt of $1.13. Based on the above its debt to total capitalization ratio was 63.2%. As of the end of the quarter the company had an undrawn amount of $21.9 million under its credit facility. According to our estimates, EGLE had approximately $28,000,000 cash on hand (including restricted cash), as of the end of the first quarter. We must note that based on the latest amendment of the credit agreement with its lenders, the company has to maintain minimum liquidity (cash & cash equivalents plus any undrawn amount under the credit facility) of $36,000,000 as of May 31st, 2012. In addition, beginning on June 1st, 2012, EGLE has to maintain a minimum cash balance of $32,094,006, representing the first payment due under its credit facility. Eagle Bulk Shipping owns a modern diversified fleet of 45 SUPRAMAX dry cargo vessels with a total DWT capacity of approximately 2,450,000 MT, and an average age per vessel of 5.0 years as of March 31st, 2012. The company completed its new-building program during the fourth quarter of last year and currently has no vessels on order. For the quarter ended March 31st, 2012, we estimate that Diana Shipping Inc. (NYSE: DSX) generated basic earnings per common share of $0.21 on net income of $16,800,000. We estimate that TCE Revenues were $54,600,000 and the average TCE rate was $24,000. As of March 31st, 2012, we estimate that book capitalization was $1.65 billion including shareholders’ equity of $1.23 billion, and debt outstanding of $426 million. Based on the above its debt to capitalization ratio stood at 25.8%. Diana Shipping maintains a very strong cash position. As of March 31st, 2012, we estimate that DSX had $440 million cash on hand, i.e. the company had a negative net debt balance. Following the delivery of M/V Leto & M/V Los Angeles, the company owns a modern diversified fleet of 26 dry cargo vessels (consisting of 16 PANAMAX size vessels, one POST-PANAMAX vessel, and 9 CAPE SIZE vessels), with a total DWT carrying capacity of approximately 2,900,000 MT, and an average age per vessel of 6.7 years as of March 31st, 2012. During the quarter DSX ordered two PANAMAX new building vessels scheduled for delivery at the end of 2013 for a contract price of $29 million per vessel. The company is also scheduled to take delivery of two additional vessels during the month of May 2012. In addition, Diana Shipping has a 14.5% interest in Diana Containerships (NASDAQ: DCIX), a publicly traded company specializing in container ships. Based on yesterday’s stock closing price of $7.97, we estimate that DSX has a market capitalization of $662 million and an enterprise value of $648 million. For the quarter ended March 31st, 2012, we estimate that Genco Shipping & Trading Limited (NYSE: GNK) generated basic earnings per common share of ($0.89) on net loss attributable to GNK shareholders of $31,500,000. We estimate that the company generated net consolidated TCE Revenues of $57,000,000 and that the average TCE rate was $10,350 (including the vessels owned by the company’s subsidiary Baltic Trading Limited). We also estimate that EBITDA for the quarter was $25,250,000. At the parent level and as of March 31st, 2012, we estimate that book capitalization was $2,700 million, including shareholders’ equity of $1,125 million, and total debt of $1,575 million. We also estimate that the debt to capitalization ratio was 58.3%. We estimate that GNK had approximately $215 million cash on hand (including restricted cash) at the parent level as of the end of the first quarter. Based on the company’s closing price of $5.45 as of April 27th, 2012, we estimate that GNK has an enterprise value of $1,560 million. As of March 31st, 2012, Genco Shipping & Trading owned a modern diversified fleet of 53 dry cargo vessels with a total DWT capacity of approximately 3,812,000 MT, and an average age per vessel of 6.87 years. In addition to the company’s own fleet, its subsidiary Baltic Trading Limited (NYSE: BALT) owns a fleet of nine dry cargo vessels with a total DWT capacity of approximately 672,000 MT, and an average age per vessel of 2.42 years as of March 31st, 2012. GNK has a 25% ownership interest in Baltic Trading Limited. For the quarter ended March 31st, 2012, we estimate that Baltic Trading Limited (NYSE: BALT) generated net loss of $4,700,000 or ($0.21) basic earnings per share. We estimate that the company’s net TCE revenues for the quarter were $6,100,000 & the fleet average TCE was $7,400. We also estimate that during the first quarter of 2012 BALT eked out a positive EBITDA of $100,000. As of March 31st, 2012, we estimate that the company had $101,250,000 in debt outstanding and a total book capitalization of $376,000,000. Its debt to capitalization ratio stood at 26.9%. We also estimate that the company had cash on hand of $5,200,000. BALT also had $38,750,000 available under its credit facility, to finance future vessel acquisitions and for working capital purposes. The company has in the past declared variable quarterly dividends based on cash available for distribution, but also after taking into account the company’s cash flow & liquidity and capital resources. Based on the company’s formula for cash available for distribution, BALT will not have the capacity to declare a dividend this quarter. Taking into account however that: (I) BALT has paid a consecutive dividend since its IPO in March 2010, and (II) BALT has previously declared dividends in excess of cash available for distribution, we expect BALT to declare a token dividend of $0.04 per share. Based on yesterday’s closing price of $4.62 per share, we estimate that BALT has a market capitalization of $105,000,000 and an enterprise value of $199,000,000. BALT operates a modern diversified fleet of 9 dry cargo vessels, consisting of 3 handy size vessels, 4 supramax size vessels and two cape size vessels, with a total DWT capacity of approximately 672,000 MT, and an average age of 2.4 years as of March 31st, 2012. For the quarter ended March 31st, 2012, we estimate that Navios Maritime Partners L.P. (NYSE: NMM) generated net income of $17,000,000. We estimate that earnings attributable to common unit holders were $16,620,000 or $0.30 per common unit. We also estimate that Time Charter & Voyage Revenues for the quarter were $48,700,000 and the average TCE rate was $30,600. Navios Maritime Partners operates a fleet of 18 vessels with an aggregate DWT capacity of 1,945,000 MT and an average age of 7.42 years as of March 31st, 2012. NMM owns sixteen of the 18 vessels in the fleet and operates the remaining two on long-term operating leases with purchase options. We forecast that NMM will declare a quarterly cash distribution of $0.44 per common unit for the quarter, unchanged from the previous quarter. For the quarter ended December 31st, 2011, we estimate that Eagle Bulk Shipping Inc. (NASDAQ: EGLE) generated basic loss per common share of ($0.05) on net loss of ($3,200,000). We estimate that the company’s fleet of 45 owned-vessels generated net TCE Revenues of $59,900,000 for an average TCE of $14,600. We also estimate that EBITDA for the quarter was $26,900,000, and Adjusted EBITDA (for credit agreement purposes) was $28,900,000. Our estimate is based on the following key assumptions: (I) It excludes the results of the company’s freight trading operations, (II) It excludes any new provision for bad debt with regards to Korea Line, or any write-down of vessel values, and (III) Two of the company’s vessels were dry-docked during the quarter, resulting in 22 total days off-hire. As of December 31st, 2011, we estimate that book capitalization was $1.80 billion, including shareholders’ equity of $0.67 billion and total debt of $1.13. Based on the above its debt to total capitalization ratio was 62.8%. According to our estimates, EGLE had approximately $23,000,000 cash on hand (including restricted cash), as of the end of the fourth quarter. EGLE also had access to an additional amount of $21,875,735 under its revolving credit facility. We must note that based on the amended credit agreement with its lenders, the company has to maintain a minimum liquidity of $500,000 per vessel or total of $22,500,000 (including any undrawn amount from its credit facility), from January 31st, 2012 until March 30th, 2012. Eagle Bulk Shipping owns a modern diversified fleet of 45 SUPRAMAX dry cargo vessels with a total DWT capacity of approximately 2,450,000 MT, and an average age per vessel of 4.8 years as of December 31st, 2011. The company completed its new-building program during the fourth quarter and currently has no vessels on order. For the quarter ended December 31st, 2011, we estimate that Diana Shipping Inc. (NYSE: DSX) generated basic earnings per common share of $0.23 on net income of $18,600,000. We estimate that TCE Revenues were $54,500,000 and the average TCE rate was $25,400. As of December 31st, 2011, we estimate that book capitalization was $1.58 billion including shareholders’ equity of $1.21 billion, and debt outstanding of $374 million. Based on the above its debt to capitalization ratio stood at 23.6%. Diana Shipping maintains a very strong cash position. As of December 31st, 2011, we estimate that DSX had $425 million cash on hand, well in excess of its debt outstanding. During the first quarter of 2012, the company borrowed $16.125 million to partially finance the acquisition of M/V Leto (The vessel was delivered on January 16th). DSX has also entered into a loan agreement for an amount of $82.6 million, to finance its two new-building vessels (M/V Los Angeles was delivered on February 8th, whereas M/V Philadelphia is scheduled for delivery in the second quarter of 2012). Following the delivery of M/V Leto & M/V Los Angeles, the company presently owns a modern diversified fleet of 26 dry cargo vessels (consisting of 16 PANAMAX size vessels, one POST-PANAMAX vessel, and 9 CAPE SIZE vessels), with a total DWT carrying capacity of approximately 2,900,000 MT, and an average age per vessel of 6.6 years. Based on today’s stock closing price of $9.13, we estimate that DSX has a market capitalization of $754 million and an enterprise value of $703 million. For the quarter ended December 31st, 2011, we estimate that Genco Shipping & Trading Limited (NYSE: GNK) generated basic earnings per common share of $0.04 on net income attributable to GNK shareholders of $1,300,000. We estimate that the company generated net consolidated TCE Revenues of $94,900,000 and that the average TCE rate was $16,950 (including the vessels owned by the company’s subsidiary Baltic Trading Limited). We also estimate that EBITDA for the quarter was $58,800,000. At the parent level and as of December 31st, 2011, we estimate that book capitalization was $2,730 million, including shareholders’ equity of $1,140 million, and total debt of $1,590 million. We also estimate that the debt to capitalization ratio was 58.2%. We estimate that GNK had approximately $240 million cash on hand at the parent level as of the end of the fourth quarter. Based on the company’s closing price of $8.78 as of February 17th, 2012, we estimate that GNK has an enterprise value of $1,670 million. As of December 31st, 2011, Genco Shipping & Trading owned a modern diversified fleet of 53 dry cargo vessels with a total DWT capacity of approximately 3,812,000 MT, and an average age per vessel of 6.62 years. GNK completed its new-building during the fourth quarter of 2011 with the delivery of the vessel GENCO SPIRIT. In addition to the company’s own fleet, its subsidiary Baltic Trading Limited (NYSE: BALT) owns a fleet of nine dry cargo vessels with a total DWT capacity of approximately 672,000 MT, and an average age per vessel of 2.17 years as of December 31st, 2011. GNK has a 25% ownership interest in Baltic Trading Limited. For the quarter ended December 31st, 2011, we estimate that Safe Bulkers Inc. (NYSE: SB) generated net income of $23,350,000 or $0.33 earnings per share. We also estimate that adjusted net income for the quarter was $25,350,000 or $0.36 per share. (Our net income estimate was based on a net loss on derivatives of $2,000,000). We estimate that the company’s net TCE Revenues for the quarter were $42,700,000 & the fleet average TCE was $26,500. We also estimate that during the fourth quarter of 2011, Safe Bulkers generated EBITDA of $31,150,000, and adjusted EBITDA of $33,150,000. As of December 31st, 2011, Safe Bulkers was operating a modern diversified fleet of 18 bulk carriers (consisting of 4 PANAMAX, 3 KAMSARMAX, 9 POST-PANAMAX, & two CAPE size vessels), with a total DWT capacity of 1,715,600 MT, and an average age of 4.3 years. In addition, the company has a remaining new-building program for 10 vessels with a total DWT capacity of 902,800 MT. Six of those vessels are scheduled for delivery during 2012. For the quarter ended December 31st, 2011, we estimate that Baltic Trading Limited (NYSE: BALT) generated net income of $2,000,000 or $0.09 basic earnings per share. We estimate that the company’s net TCE revenues for the quarter were $12,800,000 & the fleet average TCE was $15,500. We also estimate that during the fourth quarter of 2011 BALT generated EBITDA of $6,900,000. As of December 31st, 2011, we estimate that the company had $101,250,000 in debt outstanding and a total book capitalization of $383,000,000. Its debt to capitalization ratio stood at 26.4%. We also estimate that the company had cash on hand of $9,000,000. BALT had a remaining $40,000,000 under its amended 2010 credit facility, to finance future vessel acquisitions and for working capital purposes. The company has in the past declared variable quarterly dividends based on cash available for distribution, but also after taking into account the company’s cash flow & liquidity and capital resources. Based on cash available for distribution, we estimate that the company has the capacity to declare a quarterly dividend of $0.11 per share. In the previous three quarters BALT had declared dividends in excess of cash available for distribution. But given the rapid deterioration of spot freight markets year-to-date, with spot rates at or near cash operating levels, the company may decide to preserve some capital for future dividend distributions. Based on today’s closing price of $4.23 per share, we estimate that BALT has a market capitalization of $96,000,000 and an enterprise value of $188,000,000. BALT operates a modern diversified fleet of 9 dry cargo vessels, consisting of 3 handy size vessels, 4 supramax size vessels and two cape size vessels, with a total DWT capacity of approximately 672,000 MT, and an average age of 2.2 years as of December 31st, 2011. For the quarter ended December 31st, 2011, we estimate that Navios Maritime Partners L.P. (NYSE: NMM) generated net income of $18,400,000. We estimate that the earnings attributable to common unit holders were $16,410,000 or $0.35 earnings per common unit. We also estimate that TCE Revenues for the quarter were $49,800,000 and the average TCE rate was $30,450. Navios Maritime Partners operates a fleet of 18 vessels with an aggregate DWT capacity of 1,945,000 MT and an average age of 7.17 years as of December 31st, 2011. NMM owns sixteen of the 18 vessels in the fleet and operates the remaining two on long-term operating leases with purchase options. On January 24th, 2011, NMM declared a quarterly cash distribution of $0.44 per unit, unchanged from the previous quarter. For the quarter ended December 31st, 2011, we estimate that Diana Containerships Inc. (NASDAQ: DCIX) generated net income of $2,750,000 or $0.12 basic earnings per common share. We also estimate that TCE Revenues for the quarter were $9,500,000 and the net average TCE rate was $20,700. As of December 31st, 2011, we estimate that the company had a total book capitalization of $208 million. DCIX intends to declare a variable quarterly dividend equal to 70% of its operating cash flow. According to our estimates for the fourth quarter, the company generated cash from operations of $5,100,000. On this basis, we forecast that DCIX will declare a quarterly dividend of $0.15 per share, in line with the cash dividend declared for the previous quarter. During the fourth quarter of 2011, the company announced the acquisition of two panamax containerships, with an average age of 10.4 years, for a total cost of $66,000,000. The company also entered into a $100 million revolving credit facility (with the option to increase the borrowing limit to $150 million). On January 10th, 2012, DCIX also announced the acquisition of two additional panamax containerships, with an average age of 16.2 years, for a total cost of $60,000,000. All four vessels are scheduled for delivery during the first quarter of 2012. Assuming that the company will utilize the full $100 million credit facility to finance its acquisition program, we project that DCIX will have a pro-forma capitalization of $308 million, a debt to capitalization ratio of 32% and remaining cash on hand of approximately $23 million. Following the acquisition program, Diana Containerships will own a fleet of nine panamax containerships, with an aggregate capacity of 37,422 TEU, and an average age of 13.5 years. Diana Shipping Inc. (NYSE: DSX) maintains a 14.5% ownership share in the company. The acquisition of the four vessels will greatly enhance the company’s ability to distribute dividends to the shareholders. Based on 70% of operating cash flow dividend payout ratio, we estimate that the company will have to capacity to double the quarterly dividend from the current level of $0.15 per share to $0.30 per share for fiscal year 2012.